Jimmy Fallon is not known for his vocal skills, but when Vanessa Hudgens made an appearance on his show earlier this week, the audience got to experience the talk show hostai??i? ?s musical talent. While he has sung in many of his own shows previously, his duet with Vanessa made everyone take notice. 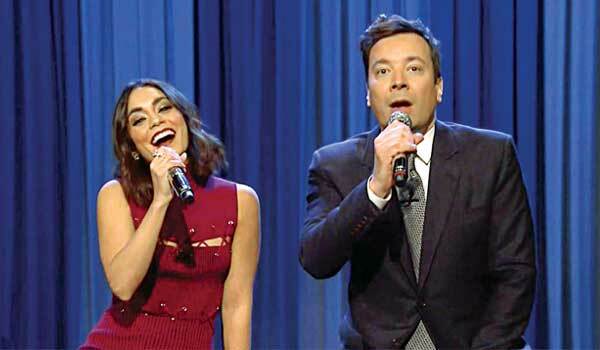 On the show to promote her new sitcom, Powerless, the actress joined Fallon on the stage to perform their rendition of the F.R.I.E.N.D.S theme song, Iai??i? ?ll Be There For You. The two voices seamlessly blended together in their version, which was sung as a heartfelt ballad. Excited, angry, perplexed, amused, sad, happy, and many other emoji-like expressions on the face of actress Winona Ryder sent the world wide web into a tizzy. In the clip from the Screen Actors Guild Awards ceremony, the 45-year-old actress expresses her intense emotions when her co-star David Harbour (from the Netflix series Stranger Things) delivered a rousing speech after receiving the Best Ensemble Drama award. The video has been shared over 200,000 times. THE King of Bollywood, Shah Rukh Khan, gets candid on camera with the comedy group AIB in their series titled, The AIB Podcast. Khan, in the comfort of his home, opens up about his career and family life. His segment about being a fan of Meryl Streep makes him even more relatable than before. He makes jokes at his own expense and the panel and, as usual, wows the viewers with his wit and charm.